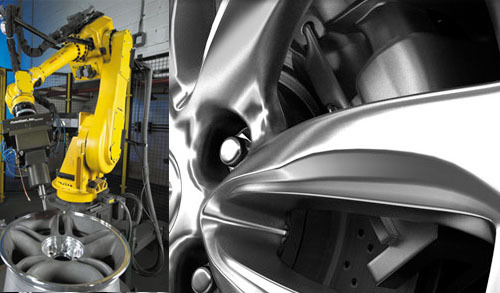 We take pride in our custom Chrome-like Wheel Polishing Services offered. We only ship out the finest Metal Polishing orders only after they meet our strict criteria for Mirror Finish Quality and Shine! We specialize in custom modifications to Wheel such as aluminum, stainless steel, titanium, and brass, bronze and other metals which all have to meet our strict quality control before it ever leaves out of our shipping department to the customer. Don't be fooled by some of the other so-called Wheel Polishers out there as our Wheel Polishing Services are Superior to anyone around with our unique polishing process. We Polish Car Parts to a Chrome - Like Mirror Finish every day, so put our experience in the Metal Polishing Industry to work for you! We receive orders from all over the U.S. and internationally as well, so rest assured your Metal Polishing Order will be safe with us. Polishing Wheels is our specialty and it doesn't matter what kind of car you have needing Wheel Polishing work performed we can take care of your polishing needs weather it is a wheel from a Chevy Corvette, Ford Mustang GT, Ford Mustang Cobra, Chevrolet Camaro, Pontiac Firebird, Pontiac Trans Am, Dodge Viper, Lamborghini, Lotus, Ferrari, Toyota Supra, it doesn’t matter. As long as your vehicle has a wheel on it we can polish it to a Chrome-like Mirror Finish and that is 100% GUARANTEED!